Anyone that knows me, knows what a germophobe I am. God has brought me a long way, but I honestly think it got worse after I had children. My poor first-born was constantly getting his hands wiped, and had major sensory overload issues with anything that made him feel sticky or dirty. Even now, my kids know – if we go anywhere – we take bottles and Germ-X and antibacterial wipes. Our Thanksgiving trip to Iowa was no different. I packed my usual bag of tricks to “re-clean” the hotel rooms before my family brought up our luggage. We wipe down the remotes, the knobs, the phones, the light switches… the tubs, toilets and sinks. Everyday Bleach cleaner is sometimes my best friend. 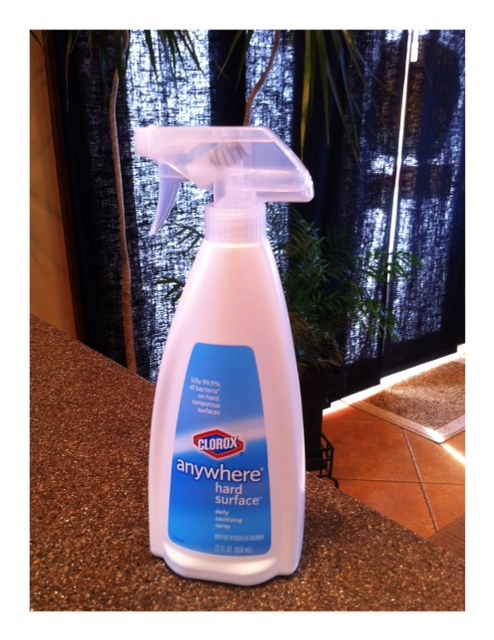 My "best friend" around the house with lots of germ spreaders! I annoy most people with my tendencies, and I know it. But SOME people, like my own mother who used to make fun of me, come to appreciate that I’m conscience of spreading germs and attempting to be prepared. (Things change a lot when you’re battling cancer and you HAVE to make more of an effort!) It’s nice to be appreciated. We had a fantastic Thanksgiving, and I think I ate pretty well. I didn’t over eat anything – except a TINY extra chocolate covered peanut butter rice krispy treat. (I no longer make large pans of these, because I know what happens!) Ommm-nom-nom…. Delishiousness! God gave me the strength – and felt good about all of my choices! We arrived home just 3 short days after we left and I stayed up late unpacking and cleaning floors in preparation for our decorating weekend! I opened my eyes on Saturday morning to an unusual 6am wake up. It wasn’t a child waking me up, but rather – my aching stomach. At first I had hoped I just had eaten something that made me sick, but unfortunately my body quickly let me know otherwise. After getting sick all morning and having an ab charlie horse (ouch! Those REALLY hurt! )… I ran a low-grade fever all afternoon and evening and enjoyed a day of rest in my bed. The next day I was excited to get back to life as “Normal” – since I felt so much better, but my body had other plans after being with a fever the day before. “Rest today, take it easy,” It said. Nope. There was no denying, I needed more rest. The kids were wonderful all weekend, as was my husband. He even went to Panera Bread and got me low-fat chicken noodle soup when I was able to eat. Everyone pitched in to keep the house from falling down around us. The children made me pictures, and snowmen, construction paper chains, and sent notes of love. No one starved, and the kids survived waiting a day to decorate the tree. I also got two naps on Sunday… COUNT THEM – TWO! I finally felt 100% and ready to get back at working out yesterday… Praise God! I forgot how much I missed my DVDs when I couldn’t work out!! Seize each day for His glory! We aren’t promised another one! “For, ‘All people are like grass, and all their glory is like the flowers of the field; the grass withers and the flowers fall, but the word of the Lord endures forever. Posted on November 30, 2011, in Truth. Bookmark the permalink. Leave a comment.